[Updating] Finance Minister Bob Richards is set to deliver the 2017 Budget in the House of Assembly this morning [Feb 24], which will set out the Government’s financial plans for the upcoming fiscal year. We will be covering the Budget all day, providing live updates as the Minister delivers the speech, as well as posting a copy of the full speech and reactions as they come in. Did you read all that? As spending on civil service salaries and extensive benefits comprise the bulk of taxpayer collected dollars, hopefully something will be done to ease the burden on the elelectorate, particularly as the average wage in the private sector is more than ten thousand dollars less than in the civil service. 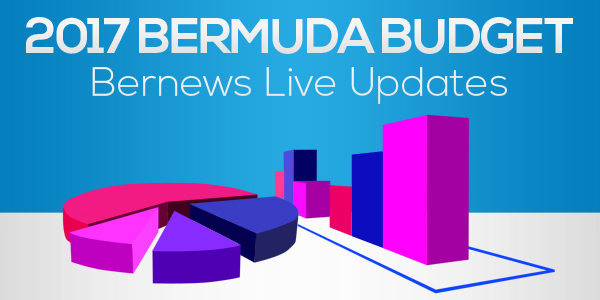 It’s not fair for the majority of Bermudians to unreasonably underwrite the burden of running a Government that is far too big for a community of our size. Especially one that lacks any form of accountability or evaluation at its upper managerial level. What numbers are you using? Civil Servant numbers have been reduced thru different measures. Stop acting like it’s the same size as in 2012. Civil Service is still too large. You cannot compare avg civil service wages with the private sector. Civil service does not have waiters, convenience/grocery store cashiers, bag packers, etc. These very low wages skews the averages. So 32n64w do you want wholesale redundancies or firings of the excessive civil servants that were hired during the PLP tenure? I have seen some attempts by the current government to reduce this unwieldy burden. which I didn’t see in previous administrations. Can who ever is coughing cough away from the mike? Sheesh. Still not voting for the OBA with their fuzzy numbers. Indeed. What we need are solid PLP numbers, because you can rely on them….doubling. That’s because you hate BDA. Plp do not have anyone capable of being finance minister. Also they may not want to take on any long running legal battles if you know what I mean. When are they going to take responsibility for the debt of Bermuda. They have been the government far too long not to take ownership of our continued failing economy. Step up to the pkate ! Civil servants alone assisted this for 2 years making a sacrifice to facilitate with fixing the debt. Yet we have Ministers spending 10s of thousands of dollars on trips, etc. Pull your socks up OBA ! On day 1 of the Obama administration he took responsibility for the debt he inherited you guys are years in still trying to point fingers ! The last few years have been your OBA budgets that have been in operation. While I understand your point of not pointing fingers, I think both parties are guilty of that. Since you are so keen to have our government follow the example of Obama, does that mean you are OK with the BDA government increasing our debt. In case you are not aware, Obama increased the U.S. debt during his time in office? You can read about it here if you are not aware and would like to know more (https://www.thebalance.com/national-debt-under-obama-3306293). Im ok with them taking ownership ! Its their responsibility to fix it ! While your assertation that Obama raised the debt during his tenure is correct, it neglects the reality that he also reduced the deficit. You can’t avoid debt when your run anything at a deficit, and th deficit he inherited was monstrous, much like our was. Maybe not the same in $’s, but as scale goes… the PLP created a government that ran on an annual deficit of 40%+ of the government revenues. It is very easy to rack up a deficit like that, but it is inversely difficult to take it down, at least not without cutting so much government you would risk its services and collapse. Course when you run a government at a deficit, you will eventually result in its collapse. In order to tackle the debt, they must first eliminate the deficit… your suggestion on this is…..? Oh, it should be noted that they have in fact eliminated the government deficit, but because of the heavy burden on borrowing that they inherited, the servicing of that debt is what is driving the overall deficit. A runaway train doesn’t stop when you put on the brakes, it can take miles, when you have as heavy a load that has been placed there. If the OBA are reelected, there is a good chance that we might actually start seeing an elimination of the debt load and need for borrowing within the next 2 budgets, but do note that at the last budget reply, the PLP have promised to return to the old spending ways if they are elected, meaning that we will return to an actual government deficit again. So let me get this right. If you make between 48 and 96 your tax goes down by .25% and you increase the insurance by 2.5%. so were are we taking home more? Very insightful (or perhaps Inciteful) AND Mr. Roban, YOUR LOT DID WHAT?? It is a lot easier to criticize than DO!! Cost of doing business here has just gone WAY up. Good bye International Business!! There are far too many less expensive jurisdictions. So now, who’s chasing who? Well once again it is Friday. Cash check/cheque hit the bars and clubs and get off the typing machine for a few hours……………well a couple of tax………………….. IT IS WRONG,FOR A COUNTRY TO BE IN DEBT. IT IS WRONG,to Live for today and pay tomorrow. IT IS WRONG,to Increase our cost of living by taxation. IT IS WRONG,to Tax big business who will only pass it on. It IS WRONG ,to pass the debt legacy on to our children. IT IS WRONG,to Tax off shore Business employees. IT IS WRONG,to”Double dip”taxes to further increase revenue. IT IS WRONG,to Tax seniors as they have more than paid their fair share. It Is WRONG to pass on a one sided budget based on taxation where there are no significant policies to decrease Government spending.They did all that behind closed doors. So much for TRANSPARENCY !